First, make sure the sling is not twisted. 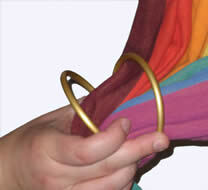 Examine the rings to make sure they are securely sewn in each time you use the sling, as they will be holding the weight of your child. 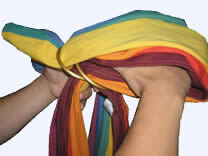 Keeping the sling untwisted, hold the rings and pull the fabric through both of them, from the underside of the sling. 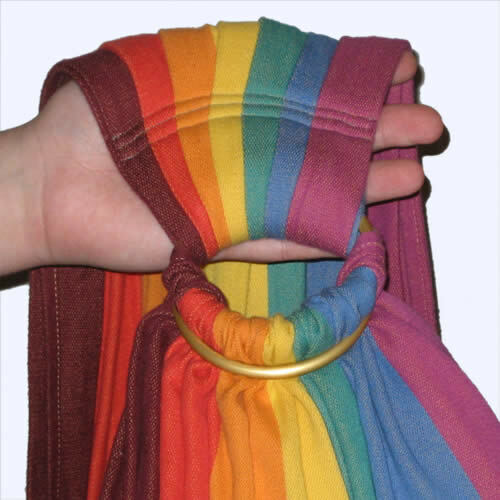 Make sure the sling fabric stays untwisted as you pull the fabric through, and try to keep the edges of the sling on the outsides. 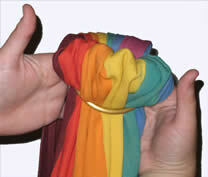 Pull the fabric back through the bottom ring alone. 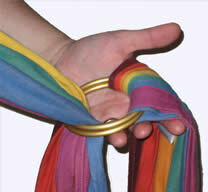 This is often easier if you hold the rings apart slightly, especially if the fabric is particularly thick. 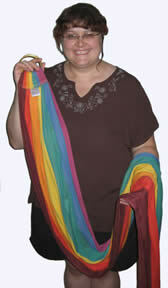 You may need to pull the edges outwards a couple of times while threading. When I'm done threading a sling this way, I take a moment to spread the fabric out in the rings, making sure the fabric doesn't overlap itself within the rings. It's much easier to adjust that way. Threading completed. 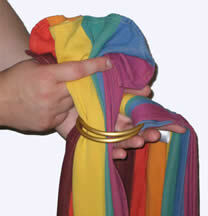 The fabric should be tight through the upper and lower rings.